It was cold and wet beyond belief and most people were wrapped up indoors and making the most of modern comforts, like central heating and showers. We weren’t. We decided that what we needed was a trip to the Lake District in our van. We packed all our blankets, jumpers, coats, boots and thermals into the small storage compartments in the back of our van and made sure we had plenty of gas and heating supplies for the next week. We packed numerous dog coats and blankets too for Winston the Pug. Our plan was simple. We were not going to let the weather stop our fun! As we slowly, (our van only does slowly), made our way up north on the dreaded M6 motorway, being overtook by haulage lorries and being buffeted by strong sidewinds, my optimism started to drain. The weather was awful. The wipers barely coped with the spray from the traffic and the snow was building up on the embankments the further north we traveled. There was no turning back now though. Whether it was due to stubbornness or resilience we continued the journey north and after 5 hours on the road we arrived at our destination. We are members of the Caravan and Motorhome Club for times just like this. Wild camping is brilliant and you can end up in some amazing locations, but when the weather is against you and you’re already battling the gods, (or so it seemed), you need a stable base to build your adventures from. We stayed at the Meathop Fell club site. 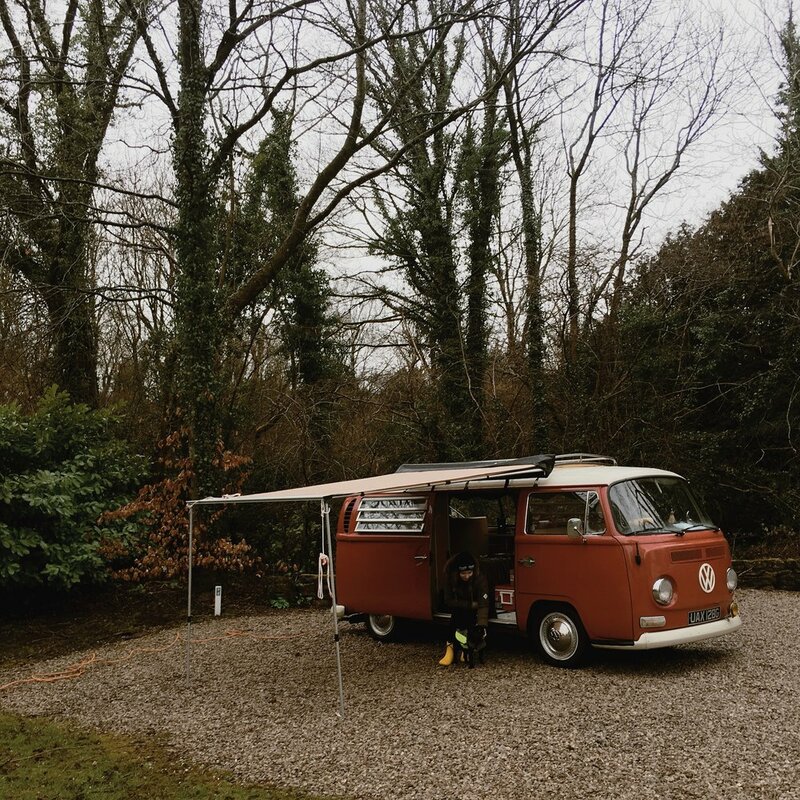 Nestled in amongst tall trees in the south of the Lake District National Park, it was a perfect location to explore the southern lakes. Windermere and Coniston Water were close by, as was Grizedale Forest. We set the van up ready for our week in one of the most beautiful places on Earth; The English Lakes. Our first 2 days consisted of rain and more rain. We entertained ourselves as much as we could, playing games, cooking tasty one stove meals and exploring the local area. After a few days we started to go a little mad and had to leave the local area so we started to make some plans. 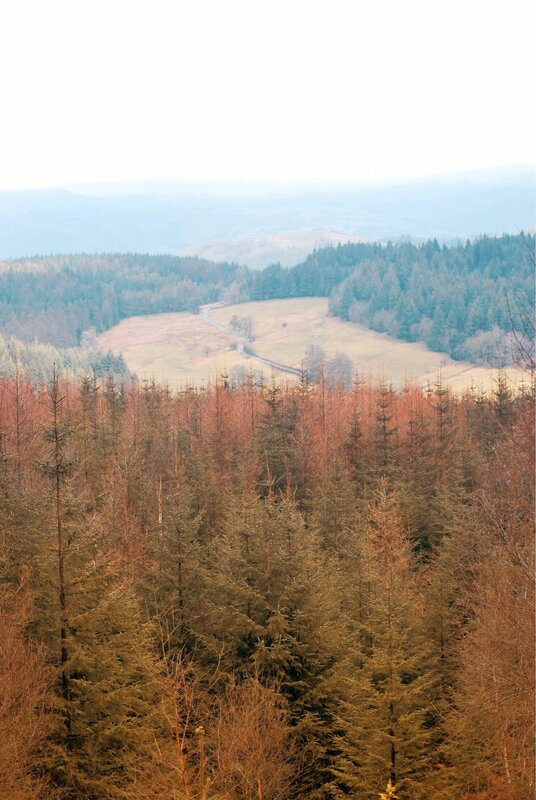 Grizedale Forest is a large forest in between Windermere and Coniston Water. It is managed by the Forestry Commission and therefore has many of the activities that other Forestry Commission sites have throughout the U.K. Mountain Biking, Rope Courses and other visitor attractions are subtly built into the trees. There are also many hiking trails and that’s what we planned to explore. We aimed to get to the highest part of the forest and hopefully grab a view of both lakes to the east and west. We arrived in the rain and got prepared for our hike. Waterproof trousers and hiking boots were on. Winston had 2 coats on and was ready for an adventure, or at ready to be dragged on one anyway! Jumpers and hats were donned and we put snacks and drinks in our backpacks. Our Peoples Poncho’s were on and we set off to find our viewpoint. The paths were like rivers! I am not just saying they were wet. They had a constant flow of 2 inch water flowing down them. We “paddled” our way up through the winding paths. We soon became part of the forest. The trees enveloped us and our course, and rather than showing us the way to go it felt like the forest was a big playground for us to explore as we wanted. When you are in a wild space during extreme weather you can’t fight it. You have to allow it to do whatever it wants to do. Today the forest wanted us to get wet. The drops falling off the trees hit us on our Poncho hoods like walnuts falling from the trees. Our faces were showered with a cold misty breeze every time the wind managed to get through the canopy above us. We didn’t mind though. We kept walking happy to be part of nature and experiencing the forest on a day like this. The People’s Ponchos were keeping us dry. In fact when we stopped for lunch and pulled my poncho up to reveal my backpack the backpack was dry and therefore, more importantly, my cake was dry! When we reached the summit of our woodland walk we were met with cloud. The two lakes of Windermere and Coniston Water could not be seen! Rather than feeling disappointed we just looked at the rolling clouds and mist rising from the tree tops. We sat atop some rocks and enjoyed the view. Our walk back down took us through pine trees and then something quite extraordinary happened. The forest thanked us! The clouds departed and blue skies were revealed. The sun burnt through the tree canopies and started to dry the forest floor. The birds came out of their storm hideouts and ventured forth for their dinner. We removed various layers of clothing until we were hiking in short sleeved t-shirts! The challenges laid before us in the morning had not only been beautiful and insistent they had rewarded us with a glorious ending to our hike. We headed back to the campsite for some warm grub and ale knowing that we had been treated by nature to a delightful display of weather and all it can offer us. It taught me a lesson. Never let bad weather get in your way. Never let the rain stop you doing something. It’s only water and you will dry out! Put having fun first. Let your happiness be your priority and acknowledge that you’ve got to make the most of every moment. We continued using our van throughout the year whatever the weather. We travelled around the U.K. and Europe in it not worrying about the weather. All we worried about was having fun! Don’t overthink your decisions. Your instincts can serve you well.